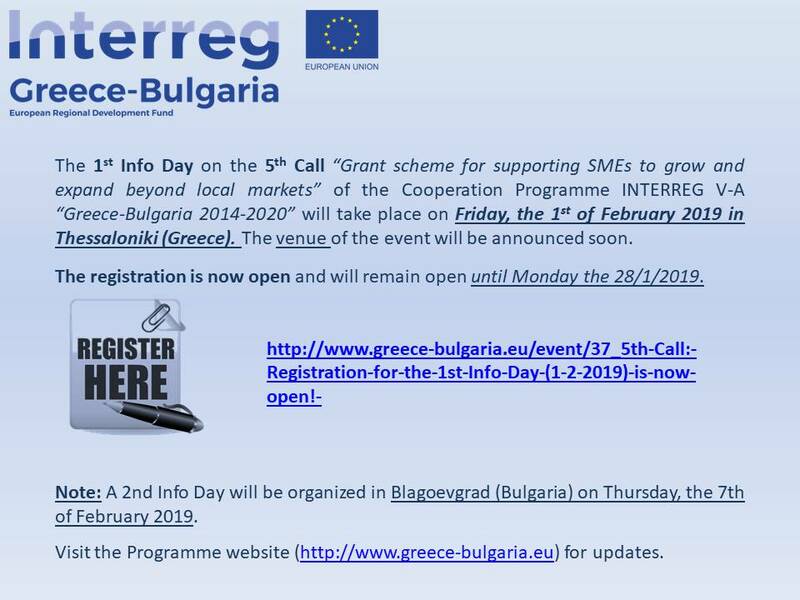 The Managing Authority of European Territorial Cooperation Programmes, the Bulgarian National Authority and the Joint Secretariat of the INTERREG V-A "Greece-Bulgaria 2014-2020" Cooperation Programme, are organizing the 1st Info Day on the 5th Call for Project Proposals “Grant scheme for supporting SMEs to grow and expand beyond local markets”, under Priority Axis 1: “A Competitive and Innovative Cross-Border Area”. The event is going to take place on Friday, the 1st of February 2019 in Thessaloniki (Greece). The venue of the event is Grand Hotel Palace (Address: 305 Monastiriou - https://goo.gl/maps/TkQq9NpwTrG2). Please note that a second Info Day is going to take place in Blagoevgrad (Bulgaria) on Thursday, the 7th of February 2019. Pre-event registration is obligatory by filling in the online form given below. The registration is now open and will remain open until Monday 28/1/2019.